For use in cooking and dressings. 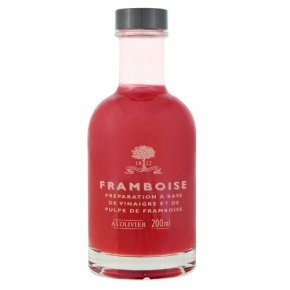 Suitable for vegetarians.Made by an artisan producer in Sain Cyr sur Mer, Provence, this vinegar has been made with fresh raspberries and is an interesting and useful addition to your cooking. Mix the vinegar with extra virgin olive oil to create a delicious salad dressing, or use after cooking meat to deglaze the pan. Also good with vanilla ice-cream, or drizzled over a apricot tart before cooking. Dress seared foie gras, a magret of duck or pan fried veal liver, as well as in a salad to accompany a rustic paté.